In selecting fresh fish, there are many details to keep into account. Though it can become mundane for some doing daily purchases, if a few specific facts are taken into consideration, you will be assured of ending up with a more taste as well as a safe product to cook and serve. When fish are caught and stored properly for transport on the ship the meat will be well preserved. How fish are treated from the time they are caught until the time they will finally be used in homes, restaurants or institutions will have major effect on nutritional value, taste, safety, and actual texture of the product. Controlling the handling process and the temperature of storage will control the growth of bacteria as well as the decomposition of the fish meat. There are many ways to determine the state of any particular fish when you are purchasing it. Fresh fish in some circles is considered still fresh when out of the water up to 72 hours, while in other circles people consider fish still fresh only up to 24 hours. http://youtu.be/RvnQhOFh6SY How ever you consider fish to be fresh, when you smell the fish and have a chance to inspect it, there are many indicators of its freshness. As for smell, there should not be a sour smell, but should have a mild odor similar to the sea. A strong odor indicates it is bad or starting to deteriorate quickly. The smell becomes stronger as the fish ages. While inspecting the fish, take into regard the temperature it is being stored. If their is a thermometer, see that it is set to thirty two degrees Fahrenheit or less. As well, make sure you are transporting your purchase on ice or cold storage of the same degree. While inspect the eyes of the fish, see that they bulge a little rather than being sunken and dry. Most fish eyes should be clear rather than show a cloudy look. The fish should have a bright red color in the gills and should not be slimy at all. The meat of the fish should spring back when pressed. Choosing melons can be an art, but choices can be more practical when their nature is understood. Generally the quality of the melon will depend on how well they were picked and handled, the manner in which they were transported, and the length of time in storage. The storage and the environment will determine final outcome of their quality on delivery. Since most melons consist of 94% water when fully ripe, this is one of the quickest ways to measurement of ripeness. By comparing two melons of equal size for the one which is heavier, you will have a good measurement of judging which melon is the riper one. Please watch the video that follows to understand more about the harvesting of melons. Though you are not harvesting melons, it is easier to understand the process of quality Ham Produce & Seafood considers when you see the choices made when they were harvested. 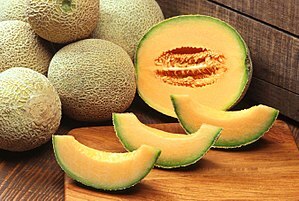 More details are written below here as to different types of melons. First selection is based on viewing any anomalies on the outside of the melon such as bruises, light spots where the melon sa t on the ground. These will indicate poor development or spoiled areas. Look for a melon which has a very even coloring over the melon. On the blossom end of the melon it should be a little soft when pressed. Usually a ripe melon will have an aroma emanating from it. This will not be noticed when taking directly from cold storage. This melon can ripen when left out for a few days, but must be caught quickly and put into storage for it can over ripen too quickly as well. Though many people have their special way of choosing a watermelon, you are at the mercy of those who picked it as to it's quality. Your best choice is selecting between melons in the batch. As stated earlier, the heavier melon of the same size will be the riper melon. Though you can tap the melon to see the difference of the sound from melon to melon, it is not a science as much as it is a practice of a fine tune ear and a lot of experience. Generally the deeper sounding melon will be the ripest. though an overripe melon will sound deep as well. In looking over the skin of the melon, there are a few thing to observe as well. The melons which have less contrast between the light and dark stripes tend to be more ripe. If you see a spot where the melon lay on the ground the color should be more yellow not white. For a more detailed explanation from a field picking point of view please click here. In selecting fresh fish, there are many details to keep into account. Though it can become mundane for some doing daily purchases, if a few specific facts are taken into consideration, you will be assured of ending up with a more taste as well as a safe product to cook and serve. When fish are caught and stored properly for transport on the ship the meat will be well preserved. How fish are treated from the time they are caught until the time they will finally be used in homes, restaurants or institutions will have major effect on nutritional value, taste, safety, and actual texture of the product. Controlling the handling process and the temperature of storage will control the growth of bacteria as well as the decomposition of the fish meat. There are many ways to determine the state of any particular fish when you are purchasing it. Choosing melons can be an art, but choices can be more practical when their nature is understood. Generally the quality of the melon will depend on how well they were picked and handled, the manner in which they were transported, and the length of time in storage. The storage and the environment will determine final outcome of their quality on delivery. Since most melons consist of 94% water when fully ripe, this is one of the quickest ways to measurement of ripeness. By comparing two melons of equal size for the one which is heavier, you will have a good measurement of judging which melon is the riper one. Please watch the video that follows to understand more about the harvesting of melons. Though you are not harvesting melons, it is easier to understand the process of quality Ham Produce & Seafood considers when you see the choices made when they were harvested. More details are written below here as to different types of melons. Fresh avocado selection is more a science than an art. Though the choice of the perfect avocado can be difficult, a few tips will help to make the selection easier. Since avocados only become ripe once picked, it is at times random as to the condition they will arrive in when they reach their destination. Normally you can judge the ripeness of an avocado by touching it to check the firmness. Though in the USA, there are a few selections available, throughout the world there are big and small avocados along with some which have no pits at all. Usually though if they are bright green and hard, they won’t be ready to server for a few days. When an avocado is ripe, the skin will be just a little soft to the touch and the skin will be a little darker. Many different processes are used to ripen avocados such as storing them at room temperature. To quick ripen Avocado placing them in a bag which helps keep the ethylene gas inside causing it to ripen quicker or place a banana or apple in the bag with it can speed up the ripening.